The exact cause of pinguecula is not known. it has been considered as age change, occurring more commonly in persons exposed to strong sunlight, dust, and the wind. it is also considered as the precursor of pterygium. 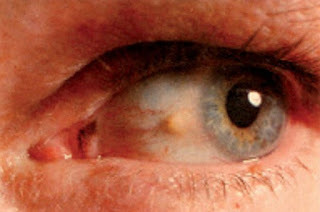 Pinguecula is a bilateral, usually stationary condition, presenting as yellowish white triangular patch near the limbus. The apex of the triangle is away from the cornea. It affects the nasal side first and then the temporal side. When conjunctiva is congested, it stands out as an avascular prominence. Mostly pinguecula doesn't cause any symptoms. But Discontinuance of natural layers of tears causes symptoms like dry eyes in some patients.Symptoms of dry eyes are foreign body sensation, itching, burning sensation, blurred vision. In the routine, no treatment is required for pinguecula. However, if so desired, it may be excised. Lubrication of the eye with drops help in relieving symptoms of dry eye.If it becomes very uncomfortable can be removed surgically. Redness and swelling can be treated with steroids and NSAIDs. Use artificial tear drops in dry conditions.